Starting your next home renovation project can oftentimes be daunting, whether you’re scouring the likes of Pinterest or simply don’t have the slightest idea of where to begin. Gathering direction to harness your project idea is paramount in implementing your design, and making this vision come to fruition is not always as easy as some of the hit television shows advertise. Fortunately, whether you’re abounding with inspiration or need a point of commencement, there are professionals to assist— like the team at Cranbury Design Center— who live to make client homes where some of life’s best moments are made. Owners Charlie Rini and Frank O’Leary are, in a sense, veterans to this industry, both getting their roots from the time they were small children working with family on smaller side projects at ages 10 and 13. Fast forward several years later to 1995, the two met and developed a personal and professional based relationship. Five years later, Rini and O’Leary married their areas of expertise, gathered their third founding partner Kim Evans—who possessed a strong background in finance and marketing—and formed what is known today as Cranbury Design Center. Once the three began business operations, they soon realized a need to hone in their offerings of services. Rini recalls they began the business still wanting to design and build, including big additions and fullscale renovations, but the “aha” moment occurred when Evans suggested providing a niche and specific focus to clientele, rather than doing it all. Evans says this design and delivery service has spanned beyond the confines of the state of New Jersey, however. Cranbury Design sees a regular influx of architects, builders and clients in need of cabinetry from Boston, New York City, and even parts of South Carolina. This nationwide success is a testament to the caliber of skill and craftsmanship possessed by both Rini and O’Leary. Rini and O’Leary pride their business on the fact that their craftsmanship and services do indeed serve all clientele and all budgets. They wouldn’t run their business any other way. Both Rini and O’Leary stress an importance on setting and sticking to a particular budget when designing your new space. In addition, Cranbury Design assists the homeowner in all phases of the project from start to finish, including selection of finishes and materials. This allows for clients to understand realistic costs and expectations and eliminates that fear factor often induced in homeowners during renovations. The design process at Cranbury Design is best described as thorough, practical and nonetheless, personal. Homeowners can more than browse through this historic picturesque showroom, boasting its nearly 300-year-old charm, 1,250 square feet upstairs and another 1,250 square feet downstairs, featuring five kitchen vignettes, two bathroom vignettes, a full-stone fireplace and a conference room. O’Leary adds that one of the kitchens, in fact, actually runs and operates for daily use. Evans recalls using the showroom kitchen one Thanksgiving about three years back, when her own kitchen was being renovated. Similarly to the approach both Rini and O’Leary took when finalizing their showroom aesthetic, Evans says she felt as if she was in her own home—not in a showroom. “We designed this place to feel like home—not like a sale,” adds Rini. 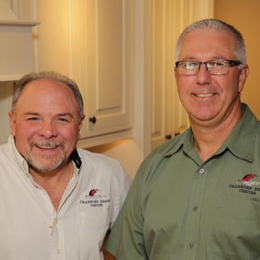 Another aspect vital to Cranbury Design’s success is undoubtedly their thoroughness in examining homeowner needs. From analyzing spatial needs to ensuring cultural customs to make a home livable are met, Cranbury Design is one of only a few design centers in the region who truly takes these needs into account. Though Cranbury Design Center’s home renovation projects technically begin with the formulation of a new idea, Rini arguably claims the process truly begins from the touch of a handshake and upon initial client contact. 145 W. Ward St. | Hightstown, N.J.